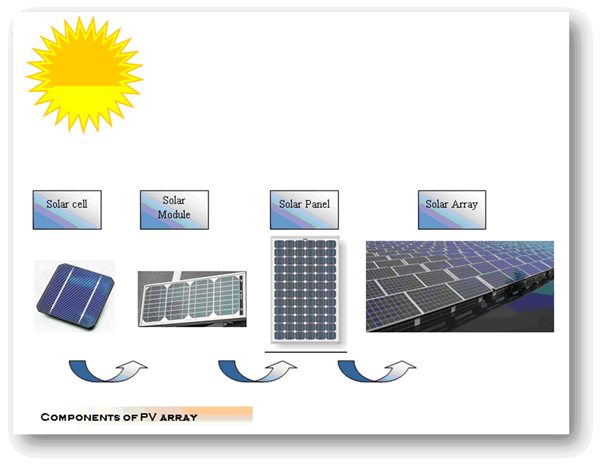 In the field of photovoltaics, a photovoltaic module or photovoltaic panel is a packaged interconnected assembly of photovoltaic cells, also known as solar cells. An installation of photovoltaic modules or panels is known as a photovoltaic array. Photovoltaic cells typically require protection from the environment. For cost and practicality reasons a number of cells are connected electrically and packaged in a photovoltaic module, while a collection of these modules that are mechanically fastened together, wired, and designed to be a field-installable unit, sometimes with a glass covering and a frame and backing made of metal, plastic or fiberglass, are known as a photovoltaic panel or simply solar panel. A photovoltaic installation typically includes an array of photovoltaic modules or panels, an inverter, batteries and interconnection wiring. Solar panels (arrays of photvoltaic cells) make use of renewable energy from the sun, and are a clean and environmentally sound means of collecting solar energy. Solar panels are typically constructed with cystalline silicon, which is used in other industries (such as the microprocessor industry), and the more expensive gallium arsenide, which is produced exclusively for use in photovoltaic (solar) cells. Other, more efficient solar panels are assembled by depositing amorphous silicon alloy in a continuous roll-to-roll process. The solar cells created from this process are called Amorphous Silicon Solar Cells, or A-si. Solar Panels constructed using amorphous silicon technology are more durable, efficient, and thinner than their crystalline counterparts. For very important solar projects, such as space probes that have to rely on solar energy, very-high efficiency solar cells are constructed from gallium arsenide by a process called molecular beam epitaxy. Solar cells constructed by this process have several p-n junction diodes, each designed to be maximally efficient at absorbing a given part of the solar spectrum. This solar panels are much more efficient than conventional types, but the process and materials involved make them far too expensive for everyday applications. The newest solar panels function on the molecular or quantum level, and represent an exciting new technology coming into play. These solar panels are created by implanting carbon nanotubes or quantum dots into a treated plastic. Unlike silicon-based solar panels, these solar panels do not have to be constructed in a clean room, and therefore production costs are somewhat dimished. Solar Array is the series of panels attached to form a large array. This is done with the single objective of generating large amount of power.